This entry was posted on Thursday, October 25th, 2018 at 8:30 am and is filed under Uncategorized. You can follow any responses to this entry through the RSS 2.0 feed. You can leave a response, or trackback from your own site. 60 Responses to Sporting Lisbon. Ramsey to Shine? When I read that Jenks is travelling I immediately thought, respect, he is a top supporter, goes home and away. Can someone explain, if we win tonight do we win the group and so are able to play youth for the remainder of the games? Looks like A.M-N hasn’t travelled unfortunately. A top squad has gone to Lisbon. No-one wanting to miss out on such a great city and a bit of sunshine maybe. 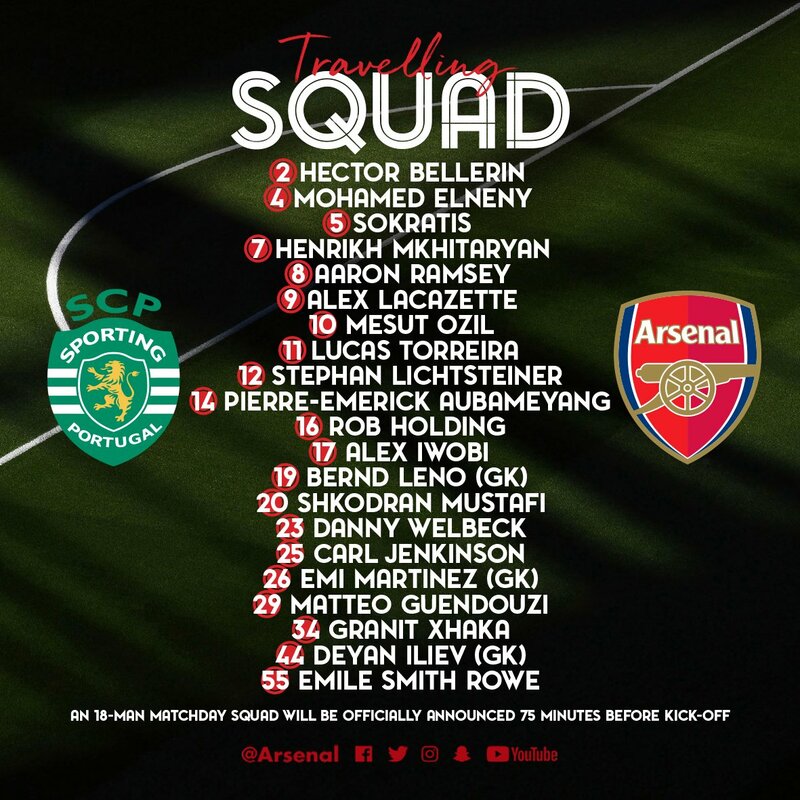 So much so that 21 have gone and only 18 can appear in the squad! Bit early for winning the group, LB. Theoretically, one of either Vorskla and Qarabag could still get 12 points with 4 games left to play. Even if Lisbon lose to us tonight, they could still get 15 points if they got 9 points from their remaining 3 matches. Loving the deliberate typo, BR. I reckon your mind was still on one of those heart attack Francesinha sandwich things from yesterday. Perhaps that’s why so many players have gone out there! Can anyone work out how it is that Emery can understand Portuguese so well? Is there a past work link? It is not automatic that Spanish can understand Portuguese. My understanding is that Portuguese understand Spanish but not the other way round. In the same way that Danes understand Swedes but not so much the other way round. I may have got that back to front. LB. Could there be a linguistic link between Basque and Portuguese? UE never worked in Portugal as far as I can discern. Maybe he is just a very clever chap or it could be that the press conference recording was edited. Does he go for the jugular to seal another confidence boosting win while getting to top spot guaranteed asap, or does he rotate heavily? I think Big Sok will start tonight. Oh, for the reminder, doh. Don’t think anyone would have guessed UE would play Xhaka at FB. Could it be a Back 3? I love the way that it is impossible to guess what Emery is going to do, it makes it all so interesting. Great to see the ref not rewarding falling over at the slightest touch. what do we reckon for 60 mins? Danny, Ramsey and Mkhi off? Not a lot to say about that half except that I am still awake. Our corners have been dreadful. Unless PEA or Welbz go wide we have no pace at all on the flanks. Got cheated by the ref for the Welbz “goal”. Lovely finish. And Fred doubts the clinical finishing talent of Welbeck! Is it me ….. or is our defending actually improving? …. Holding making the difference? – Good positional discipline defensively. Did not concede any shots on target. – Our defensive discipline was good but it affected our free flowing football on the other side of the pitch. Wellbeck was industrious though. – Slight disappointment with Ramsey and Miky though although they did work well in the second half. BR – indeed we lack pace on the flanks hence the need to get a player like Douglas Costa or Cuadrado or Mane or Sane. I d take Martial for Ramsey 🙂 but to be honest, I think the one we have a shot with is Douglas Costa. The guy is warming the bench at Juve and he will really be pushing for a starting position with us. What about DC for Ramsey? Ramsey is in Juve’s radar – they love player like Ramsey and DC can play FB, RM, RLW and FW so gives us a lot of options. Then we would need to get Gueye from Everton or Ndombele from Lyon and we can ship out El Neny and challenge Xhaka. Do we need Martial anymore? Chas there are a few words in drafts should you need, feel free to chop, change or even add. Does Douglas Costa prefer the left or the right? I’ve been out for the second half. Only just got back. You’re a life saver. Ta. Chas, out for the second half?